We'd like to be able to applaud the U.S. State Department for condemning the Egyptian government's decision to murder over 500 people, without having to choke on the fact that the U.S. government has been killing thousands of people with drones, many of them civilians -- not to mention giving massive supplies of weapons to the abusive Egyptian government that it is condemning. We'd love it if we could cheer for the U.S. government's denunciations of Russian belligerence in Ukraine, without the oppressive weight of the string of illegal U.S. wars stretching from Afghanistan through Iraq to Libya and the drone wars in Yemen and Pakistan, not to mention the NATO expansion and State Department interference in Ukraine that has escalated tensions. 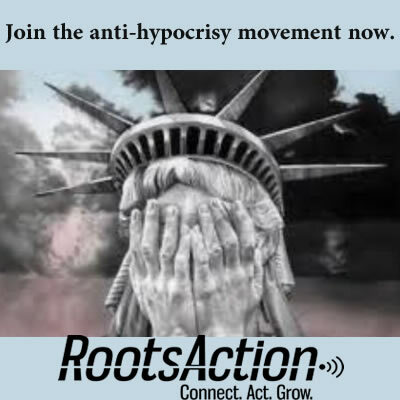 Join the anti-hypocrisy movement now. And if you know of examples of extreme hypocrisy, enter them below. Submit your examples of supreme hypocrisy, and we'll try to challenge many of them. 10532 4.9 years ago Victoria Pavlov salmo, BC , CA Amen!